Based on a recent report by Berlin-based digital company Contentpass, mobile ad blocking on Samsung devices has grown globally from 1.8 percent to 6.3 percent from October to November this fall. At Adblock Plus, we concur. As this year wraps up, we’ve seen an increase in the download of ad blockers on Android devices, improving to 13 million downloads of our own Adblock Browser for Android plus an additional 2 million downloads of Adblock Plus for Samsung Internet browser which we released back in late May 2017. Samsung device owners are finding us, and that is an extremely wonderful Christmas gift. 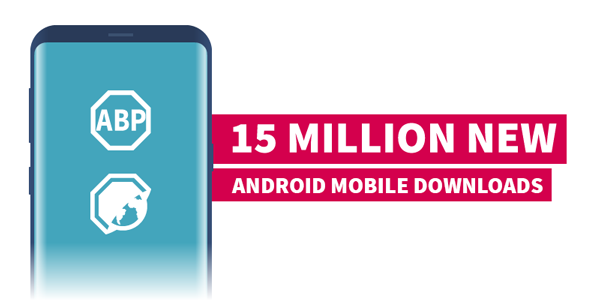 With our over 105 million active users on desktop devices, we are very pleased to see the reality of our hard work on mobile devices start convincing users on these devices as well. The fact is, as we pointed out in a survey earlier this year, only 48 percent of US mobile users know that they can block ads on their mobile device. We’ve spent a lot of time trying to educate our friends outside the Asia Pacific region this year about the benefits of ad blocking on mobile, and that will continue in 2018, since 94 percent of the mobile ad blocking worldwide currently happens in Asia. The next time you’re frustrated with how much data you use on your mobile device and the ads that you see on platforms like Facebook, YouTube or anywhere else on your mobile internet browser, please don’t forget that the ad blocking you enjoy on your desktop or laptop computer can be experienced on whatever mobile device you own. Go ahead, treat yourself and download our free apps today for Android or iOS devices. We’ve got something for everyone! How to include adblock plus in my android phone. Hey yareel! What device do you have? In any case, you could follow the links we posted at the bottom of the blog post. Back in 2006, ad companies, websites were shouting, “Adblock Plus will never take off! It’s too complicated for the average user.” Fast forward to 2017, 105 million active users. It’s only a matter of time before Asia discovers ADP. Those ad companies must be sh*tting their paints! Nicely done Adblock Plus. That’s right Michael. That is the power of the users. We are happy to make a difference, and we’ll keep fighting for a better web. Thanks for the support! ABP: forgiveness for the “ADP”, my spellchecker is always automatically correct my text. Feels like the browser is self aware. Any spellchecking within ABP browser? There’s no spellchecker within the browser. That is usually configured within the keyboard from the device. how can use this ? its available for android ? Once you download the app, let us know in case you have any specific question about how to use it, we'd be happy to help. Have a happy new year. I’m using ad blocker, & browsing without any unwanted ads. We are glad to hear that :) Let us know in case you need anything and have a great 2018 start. Cheers! Let us know in case you need anything and happy 2018! Thanks a lot for the support and happy 2018! how can use this in IOS phons ? Then, you can simply browse the web. Let us know in case you have any specific question. Happy 2018! Let us know in case you have any specific question.